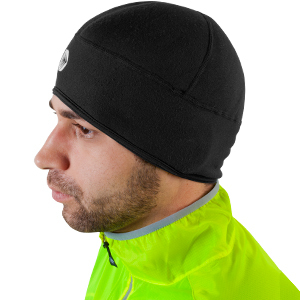 Three sizes to get the right fit you need to insulate your head. The fabric is a stretchy knitted hollow core polyester fiber that traps heat and wicks moisture away from the skin. 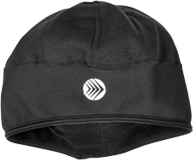 The stretch beanie is a fleece that is brushed for softness. Multiple flatlock seaming around head for perfect fit. Thin enough wear under helmet. Thick enough to wear alone for running and multiple sports. Works fine. Just what I wanted. 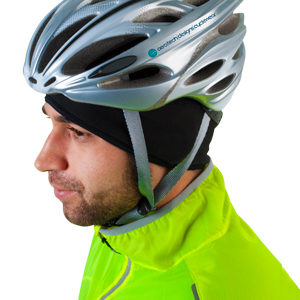 Excellent cold weather biking cap. Love it. Very satisfied with this cap. Keeps my head warm and still breathable. Highly recommended. I have other brands, but this fits the best and is very warm. Great deal on this headgear. Great addition under helmet for Cold rides. Keeps my head and ears nice and warm lightweight I do recommend for cold weather. Use in cold weather to keep your head warm and also adds cushion to the helmet. Gathered at the edge a bit like a shower cap.|I removed the elastic- now wearable doesn't look great but no lines dug into forehead.|Light fabric good for cool temps.